Anaxagoras (c. 500 BC – 428 BC) was a Pre-Socratic Greek philosopher from Clazomenae in Asia Minor. He introduced the concept of Nous (Mind), as an ordering force in the cosmos. He regarded material substance as an infinite multitude of imperishable primary elements, referring all generation and disappearance to mixture and separation respectively. Wrongly do the Greeks suppose that aught begins or ceases to be; for nothing comes into being or is destroyed; but all is an aggregation or secretion of pre-existent things: so that all-becoming might more correctly be called becoming-mixed, and all corruption, becoming-separate. Frag. B 4, quoted in John Burnet's Early Greek Philosophy, (1920), Chapter 6. Frag. B 12, quoted in John Burnet's Early Greek Philosophy, (1920), Chapter 6. Frag. B12, in Jonathan Barnes, Early Greek Philosophy (1984), p. 190. Frag. B 17, quoted in John Burnet's Early Greek Philosophy, (1920), Chapter 6. In mathematics... the Greek attitude differed sharply from that of the earlier potamic cultures. The contrast was clear in... Thales and Pythagoras, and it continues to show... in Athens during the Heroic Age. ...while Anaxagoras was in prison he occupied himself with an attempt to square the circle... the first mention of a problem that was to fascinate mathematicians for more than 2000 years. ...Here we see a type of mathematics that is quite unlike that of the Egyptians and Babylonians. It is not the practical application of a science of number... but a theoretical question involving a... distinction between accuracy in approximation and exactitude in thought. ...no more the concern of the technologist than those he raised... concerning the ultimate structure of matter. Anaxagoras of Clazomenae postulated another element called the aether, which was in constant rotation and carried with it the celestial bodies. He also believed that there was a directing intelligence in nature that he called Nous which gives order to what otherwise would be a chaotic universe. By Nous he meant literally "the Mind of the Cosmos"… Anaxagoras was the last of the Ionian physicists. The endless sequence of explanation is explicit in Anaxagoras. Even the ingredients that go to make up something and account for its behaviour are themselves composed of ingredients which are themselves again composed of ingredients. [...] In every case, behaviour is a consequence of both the predominant features (which make it seem to be such and such) and also the hidden features (which can make it do otherwise inexplicable things). And this dual explanation will apply as much to the hidden ingredients as to the macroscopic items we encounter in daily life. But still it remains true for Anaxagoras that in principle the material composition (if we could know it in detail) would account for the current behaviour of each item in the world. Unless the thing is alive, that is. For living things, it looks as though the explanation must be supplemented by appeal to another principle, what Anaxagoras called ‘Mind’. My dear Meletus, do you think you are prosecuting Anaxagoras? Are you so contemptuous of these men and think them so ignorant of letters as not to know that the books of Anaxagoras of Clazomenae are full of those theories, and further, that the young men learn from me what they can buy from time to time for a drachma, at most, in the bookshops, and ridicule Socrates if he pretends that these theories are his own, especially as they are so absurd? Is that, by Zeus, what you think of me, Meletus, that I do not believe that there are any gods?—That is what I say, that you do not believe in the gods at all. Anaxagoras held that everything is infinitely divisible, and that even the smallest portion of matter contains some of each element. Things appear to be that of which they contain the most. Thus, for example, everything contains some fire, but we only call it fire if that element preponderates. He argues against the void, saying that the clepsydra or an inflated skin shows that there is air where there seems to be nothing. In science [Anaxagoras] had great merit. It was he who first explained that the moon shines by reflected light... Anaxagoras gave the correct theory of eclipses, and knew that the moon was below the sun. The sun and stars, he said, are fiery stones, but we do not feel the heat of the stars because they are too distant. The sun is larger than the Peloponnesus. The moon has mountains, and (he thought) inhabitants. 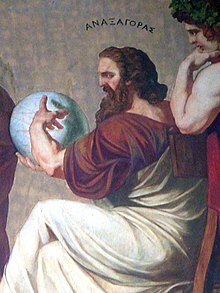 Anaxagoras was more inclined to the study of physics than of metaphysics, for which reason he is accused by Plato and by Aristotle of not having conceded enough to final causes, and of having converted God into a machine. Accordingly he explained on physical principles the formation of plants and animals, and even celestial phenomena; which drew upon him the charge of atheism. Nevertheless, he regarded the testimony of the senses as subjectively true; but as insufficient to attain to objective truth, which was the privilege of the reason.